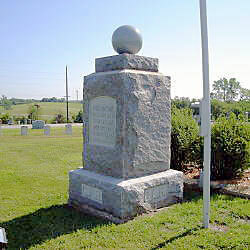 Description: A large polished granite ball is mounted on top of a gray granite base. The front is inscribed: "In Memory Of ~ Those Who Gave ~ Their Lives In ~ Defense Of ~ Their Country". "G.A.R." is carved on the base. 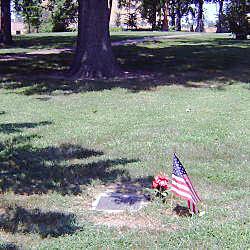 Description: A small bronze marker is mounted in the cemetery. It is inscribed: "In Service To Their Country ~ The William E. Connelley Survey ~ Of 1895-1896 Indicates A Large ~ Grave In The Area By ~ Tradition, Union Dead Were ~ Buried In This Part Of The ~ Huron Indian Cemetery ~ Following The Battle Of ~ Westport, October 21-23, ~ 1864." Description: Large square granite column with eternal sentinel on top. The front is inscribed: "Erected ~ By ~ Captain Kingscott ~ W.R.C. No 177 ~ In Memory ~ Of ~ The Soldiers ~ And Sailors ~ Who Fought ~ In Defence Of ~ The Union ~ 1861 - 1865 ~ Erected 1910". It is reported that the dedication was Memorial Day 1911 by the Captain John W. Kingscott Chapter, W.R.C. No. 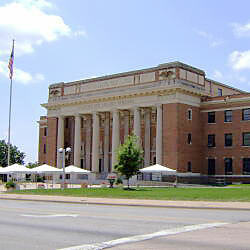 177, Department of Kansas, Argentine G.A.R. and Women's Auxiliary, Wyandotte G.A.R., Shawnee G.A.R. and K.C. Chapter of the L.G.A.R. 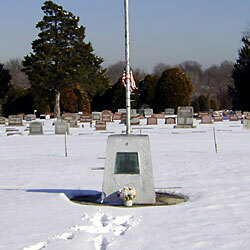 Space for the memorial was given by the cemetery owner. Cost of monument was $1,500 plus $200 for curbing. 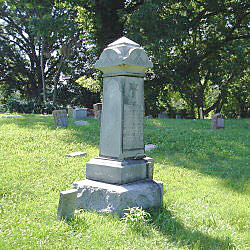 Description: Oblong marker, about six feet high, four by five feet on the ground. It cost $600, and the money was raised by subscription. On the top is an open book, with the word" MOTHER" inscribed. 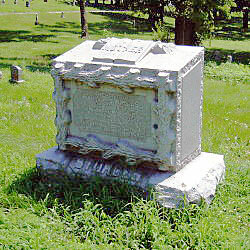 Facing west is the following: "In Memory Of Mary A. Sturges, ~ 1809-1892; ~ A Union Army Nurse ~ From 1861 To 1865 ~ Erected By ~ Burnside W. R. C. No.1 ~ Department Of Kansas ~ Sturges". On the back, which fronts east, is the following: "In Nov 1861 At The Call For Nurses ~ Mrs. Sturges With Her Daughter Mary B. Enlisted In The 6th ~ Ill Cavalry ~ Was Immediately Sent To Camp Butler Springfield, Ill, ~ Where She Entered Upon The Duties Of Regiment Nurse. ~ Here Her Patient Loving Care Of The Boys In Blue Won For Her The ~ Endearing Name By Which She Was Ever Afterwards Called ~ In Jan 62 She Was Sworn Into The United States Service And ~ Entered A Broader Field Of Hospital Work At Memphis Tenn She ~ Was Finally Placed In Charge Of Adams Block Hospital ~ And Remained Until Mustered Out Of Service In June 1865. Many Noble ~ Women Entered The Ranks As Army Nurses But None Gained A Warmer ~ Place In The Soldier's Heart Than Did Mother Sturges. The ~ Dear Old Mother Never Relaxed Her Interest In Charitable Work Until She ~ Died In Her 83d Year, Happy In A Christian Faith That Sustained Her ~ Through Life. Truly It May Be Said Of Her ~ 'This Woman Was Full Of Good Works Which She Did". 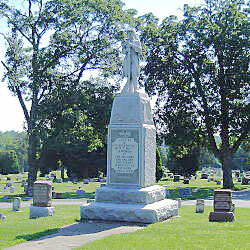 Description: Marker dedicated Memorial Day 1905 by the Sumner Relief Corps Post No. 22, W.R.C. The main inscription reads: "Erected In ~ Memory Of The ~ Known And Unknown ~ Colored Soldiers And ~ Sailors Who ~ Fought In Defense Of ~ The Union From ~ 1861 - 1865 ~ By Sumner Relief ~ Corps No 22 ~ Through The Special ~ Efforts Of The ~National Aides ~ line obliterated ~ Cora S. Dameron". One other side is inscribed: "Mrs. Cora S. ~ Dameron ~ Nat. Special ~ Recruiting Aid ~ Cornelia ~ Wilson ~ Nat. Aid". 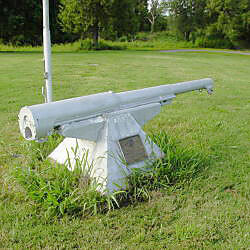 Description: A cannon tube is mounted on a concrete pedestal. The attached plaque reads: "May 30 (VFW Seal) 1937 ~ In Memory Of The ~ Wyandotte County Veterans ~ Who Made ~ The Supreme Sacrifice ~ Adams Petersen Switala Post No 111 ~ Veterans of Foreign Wars Of the U.S."
Description: A flagpole is mounted on a concrete base. Bronze plaques on the base read: "Nov 11 ~ VFW Seal ~ 1937 ~ In memory of those ~ heroes who answered ~ our country's call ~ in defence of liberty ~ dedicated by ~ Trowbridge-Kent-Frost Post No. 408 ~ Veterans of Foreign Wars ~ of the United States" and "In memory of, respect for, and in honor ~ of those comrades who served our ~ country to preserve our American ideals. ~ Rededicated May 28, .1978 ~ Adams-Petersen -Switala and Auxiliary ~ Post No 111 ~ Veterans of Foreign Wars ~ of the United States"
Description: This Memorial Hall was initially over seen by three trustees appointed in 1923: Dr. J.L. Otterman (G.A.R. ), Frnak Strickland (V.F.W.) and C. Harry Darby Jr. (American Legion). The building was completed in 1925. It is now used for civic events and concerts. A large inscription above the entrance reads: "Soldiers And Sailors Memorial". Above that is: "Dedicated To The Heroes Who ~ Fought And Died For Their Country". On either side are: "Justice Actuated Their Heroism ~ Liberty Inspired Their Courage" and "Let Us Resolve ~ That These Dead ~ Shall Not Have ~ Died In Vain".